Our goal is to create a wedding buffet so delicious that they'll be talking about it for weeks. We use organic, locally sourced whenever possible in creating menus just for you. Buffet dinners help your guests meet and mingle with each other to help get the party warmed up. Buffets make it easy to create a casual atmosphere for relaxed receptions but can easily be dressed up for a more formal affair as well. Wedding dinner buffets also offer more of a selection for your picky eaters. A buffet dinner also pleases your guests with larger appetites since they can return for additional servings. Enjoy these menus, designed specially for your event. We're delighted to work with you to customize your menu – let us know if you'd like to incorporate family favorites or specialty items. Set your wedding apart from all others with Exuberance! Menus change seasonally, using fresh, organic ingredients. 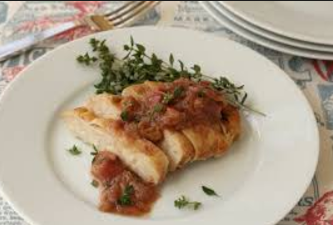 Herb roasted chicken breast with scratch made rhubarb thyme compote. Our Casual Elegance menus are family-friendly and work beautifully both outdoors and indoors. Served with rolls and butter, and lemon cucumber ice water. Red and Gold Potato Salad – Creamy red and Yukon Gold potatoes, fresh parsley in a creamy Dijon sauce. Served room temperature. Tequila Slaw with Cilantro Lime Vinaigrette - deliciously different, crisp and crunchy. Seasonal Vegetable Medley Fresh seasonal vegetables lightly dressed in olive oil, sea salt and fresh herbs. Rosemary Roasted Red Potatoes - Creamy red potatoes roasted in olive oil, fresh rosemary and sea salt. Sesame glazed salmon - wild caught, locally sourced! Special creations from Chef Cindy that set your wedding buffet apart from all others. Served with rolls and butter, and lemon cucumber ice water. French Grated Carrot Salad with Lemon Dijon Vinaigrette – French bistro favorite, and one of ours, too! Citrus Rice – fresh orange and grapefruit, toasted almonds, scallions in a honey, soy and citrus vinaigrette. Served chilled. A perfect summer entree salad - grilled marinated flank steak, tomatoes, celery and a zippy Bloody Mary sauce. Roasted Asparagus, Leek and Chevre tart - Delicate puff pastry topped with a luscious combination of roasted asparagus, caramelized leek and goat cheese. Steak Saltimbocca - delicious, elegant and gorgeous presentation! Traditional favorites, with flair. These entrees are paired with their traditional side dish. Served with rolls and butter, and lemon cucumber ice water. Caesar Salad - Romaine, Parmesan Cheese, House-made Garlic Parmesan Croutons and Creamy Caesar Dressing. Accompaniments – Our Classical Notes Entrée Selections are already paired with their traditional side dish. Select one additional Accompaniment to round out your feast. Creamy au gratin Potatoes – Tender baked potato rounds in a classic rich cheese sauce, topped with seasoned toasted bread crumbs. Chicken Marsala - A luscious, flavorful favorite. Tender chicken in a Marsala wine sauce with mushrooms, herbs and prosciutto. Tilapia with Rice Wine - Delicate white fish in a slightly sweet, slightly salty sauce loaded with Umami, topped with fresh cilantro. 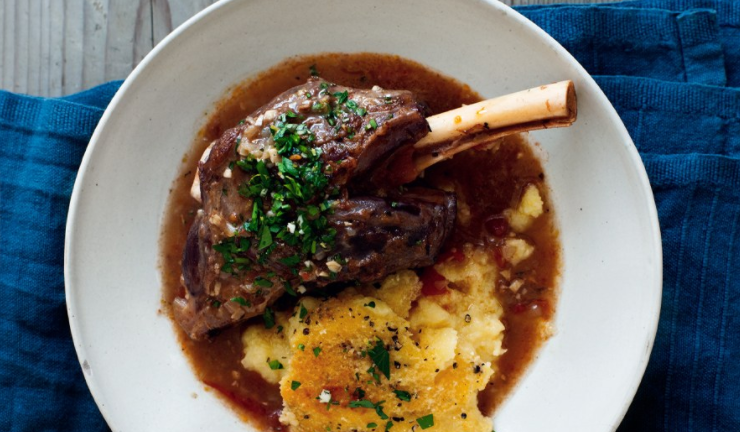 Braised Lamb Shanks with Rosemary – succulent lamb slow braised in red wine, tomatoes, carrots, garlic, onions and fresh herbs. Served with creamy polenta. Steak Saltimbocca – Deeply flavorful beef spiral filled with fresh sage, provolone, prosciutto. Elegant, beautiful presentation. Served with Penne with Radiccio and goat cheese. Gnocchi with Capers, Olives and Tomato Sauce – Soft potato gnocchi in an amped up tomato sauce with briny chopped capers, and three kinds of olives. Accompanied by Roasted Tomatoes with balsamic drizzle. Marinated Portobello stuffed with Red Onion Confit - meaty Portobello mushroom caps marinated in herbs, garlic, red wine and olive oil filled with earthy sweet Red Onion Confit.